Looking for finger licking street delicacy around North Delhi? Then Ajun ki pav bhaji located in Model town 3rd is surely a delight for all the pav bhaji lovers. Arjun, a Marathi man with magic in his fingers started his business on a small cart nearly a decade ago in a silent corner in Model town 2nd. The quality of his appetizing servings gained him all the popularity and encouraged him to expand his business to a shop in main market of Model town 3rd. Finger licking spicy Bhaji, fully prepared and garnished with big chunks of butter along with Masala Pao is the main attraction of the place. 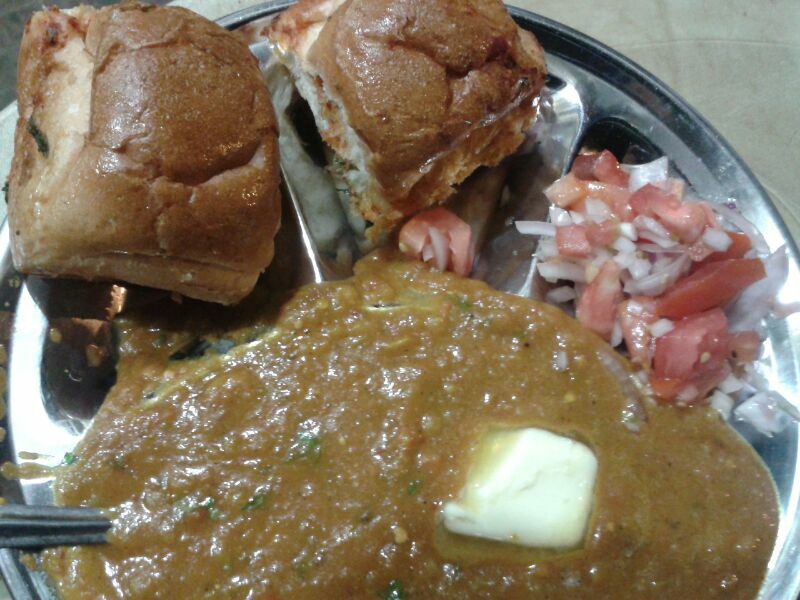 A plate of Pav Bhaji is served for Rs 80 and does justice to the quantity served to its customers. Not only Pav Bhaji, Arjun also does super spicy vegetable pulao with a tangy sauce and refreshing salad. Vada pao is another super delicious delicacy served to the customers. But special garlic Pav Bhaji is the biggest hit amongst the people. In the evening, huge crowd of people gather outside his stall, who are served sizzling hot Pav bhaji . However, you may find difficulty in parking your cars but once you taste it, trust me you will realise it is worth waiting for. Arjun Pav bhaji has a quick service so you can enjoy your meal inside your cars .The stall opens at 6pm in the evening and due to huge demand it is wrapped up around 9.30 pm. Surprisingly, Everyday it sells more than 150 plates of pav bhaji within 2hours, as estimated by Arjun, who loves to cook and feed people. Definitely try this place and let your taste buds enjoy a spicy roller coaster ride with this amazing Arjun Pav bhaji.